Chris Woods Construction has negotiated a contract with Crows Truck Service for construction of their new facility on US Highway 78 in Memphis at the edge of the Tennessee State line. 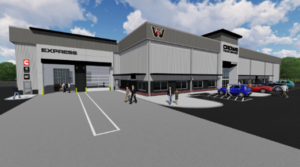 The new facility, approximately 65,000 square feet, will include sales and administrative offices, retail parts sales and parts warehouse/distribution, twenty (20) service bays, and over 11.5 acres of asphalt and concrete paving. The new $8.5 Million dollar facility is slated to get underway in mid-January, 2018.